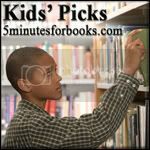 Welcome again to another Kids' Picks carnival over at 5 Minutes for Books. Last month we talked about ocean animals and, guess what?! This month we're going to do the exact same thing because why!? Repeat after me: We Love Sea Creatures. Oh yes, we do. They are "our" focus right now. 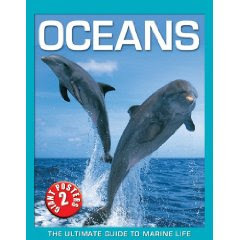 Oceans is labeled as being "The Ultimate Guide to Marine Life" and it certainly holds up the claim (especially if you are three and have devoted your entire life to the study of marine life.) Although my three year old is making the most out of this book right now, this is a book we can grow with, being designed with older kids in mind. I would say that this book is probably "best" for ages 6-12 but, like I said, my son is three and we like it just fine! This book is hardback but spiral bound which I find an absolutely fantastic combination. (I love books like this!) Immediately upon opening the book you discover two wall posters (folded up and protected inside plastic zip pouches) depicting Life on a Coral Reef and relating to ocean depths. The "Ocean Depths" poster indicates various layers of the ocean and which sea creatures you might find on what level. Sharks, sting rays, whales, dragon fish, a lantern fish, etc., etc. you get the idea! This book does a tremendous job providing basic information on a large variety of sea creatures and ocean concerns. The photographs used in this book are crisp, clear and delightful to look at. In fact, we have enjoyed looking at this book for hours on end, learning new things about the ocean that we didn't know before. I love the layout of this book. It feels very organized and straight forward, allowing you to focus on particular sections of ocean life instead of having it all thrown together in a big mess for you to sort out. "Amazing Facts" are scattered throughout the book on coral reefs to penguins alike. Oceans receives four thumbs up from us (2 thumbs per person) and we're happy to recommend it to you. THIS POST ORIGINALLY PUBLISHED AS A GIVEAWAY, BUT THE GIVEAWAY IS NOW CLOSED. Thank you, Silver Dolphin Books, for your tremendous generosity! I would definitely like to win a copy of this book! Thanks! My kids love marine life too! Last summer I worked at our local zoo which had a touch tank with various invertebrates. We loved studying the animals with books from our library. This book sounds great. I would love to be entered for the giveaway. That format does sound great! Kyle is a fan of nonfiction, so I'd love to be entered to win. Carrie- could there BE a more perfect book for your guy?? (said with "Friends" intonation, of course!) It sounds fantastic, and nonfiction books have such an appeal to young children when they're beautifully done. What an awesome resource! We would love to add this to our library - for homeschool and just for fun! Thanks for the review and the chance to win! This sounds like a great book. My son (homeschooled) is doing a unit study which includes studying the ocean, so this book would be a great reference for him. I would love to enter to win one of these for my son Jesse. He's three too, and we just returned from a trip to the beach and pier where we explored and he was fascinated by that 'other' world down below. Would love to add this to my daughter's library! My daughter would love this. Please accept my entry. Thanks! My son would love to have this book.